Last month Squadron 42's sparkling cast was revealed. 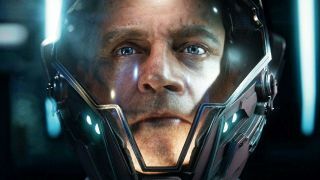 Gary Oldman, Gillian Anderson, John Rhys-Davies and Mark Hamill all take leading roles in Star Citizen's single player campaign. PC Gamer's Chris Thursten sat down with Hamill for a chat about Star Citizen, Wing Commander, Hamill's fear of getting the Joker part, the joy of sci-fi fandom and, of course, Star Wars. On the latter, here's a nugget from his discussion about non-disclosure agreements and that plot twist in The Empire Strikes Back. Spoilers ahead if you haven't seen the original trilogy. "I have something coming out where there's an amount of money that if it leaks because of me, I don't get that payment. If I keep it a secret until the day it comes out, I get that payment. "I'm good about keeping secrets. I'm proud of the fact that I knew a year and a half before anybody else that he was actually dad-Vader. I didn't even tell Harrison, or my wife, because I thought it would be terrible if she said "you know what" to a fan and it got out, because [Empire Strikes Back director] Irvin Kershner said 'I know something, I'm going to tell you. George [Lucas] knows, I know and now I'm gonna tell you, and if it leaks, we'll know it's you', because the line originally was 'you don't know the truth, Obi Wan killed your father' and he said 'we're going to take that line out and put in 'I am your father'. "I thought, well first of all if Sir Alec Guinness is the real villain, that's a pretty good twist in and of itself, but this is even better. I couldn't believe it. I was so excited. It was a mind-boggling plot twist."